As the official biographer of Henderson, Neat was given unique access to the ‘enormous, un-catalogued collection of fascinating, largely unpublished material’ that remains in the possession of the poet’s family. But even with such unrestricted access to this rich resource, Neat’s biography is disappointing and largely unsatisfactory. Henderson was born in 1919 in Perthshire, the son of Janet Henderson, an unmarried 39-year-old who had been a Queen Alexandra Nursing Sister in France. His name was registered as James Scott Henderson, though he was called Hamish throughout his life. Henderson sometimes said that he was the son of a cousin to the Dukes of Atholl, therefore directly descended from Robert II. However, Neat gives various names as contenders for Henderson’s paternity: these include James Scott of Glasgow, a commercial traveller; James (Hamish) Stewart Murray, ninth duke of Atholl; the novelists Neil Gunn and Neil Munro; and John George Stewart Murray, marquis of Tullibardine. Neat believes that Henderson’s father was most likely James Scott of Glasgow, although in an appendix, ‘Other Claims About Hamish Henderson’s Paternity’, he puts forward interesting anecdotal information about the Tullibardine claim, with the rider that ‘such anecdotes… prove nothing’. 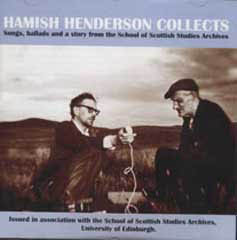 Whatever his paternity, Henderson was a ‘lad o’pairts’, with a precocious talent for poetry and song, and an early interest in language, absorbing the old Perthshire dialect of Gaelic still spoken by the older generation. Neat tells us that Henderson wrote his first anti-war poem at the age of eight. Following the death of his maternal grandmother, the 8-year-old Hamish and his mother left Scotland for Somerset, where Janet Henderson had found work as a cook-housekeeper. Hamish was sent as a boarder to a small, mixed prep school, run by a Scot, who, after Janet Henderson’s early death in 1933, became Hamish’s legal guardian. How his school fees were paid is not known, and this, Neat writes, has added to the speculation surrounding his paternity. Later, however, it was a combination of ‘hard work and academic scholarships’ that took Hamish to Dulwich College and then to Cambridge. But there the speculation seems to end, as we are told that his scholarship to Dulwich paid only his tutorial fees, and Hamish was required to board at the Clapham Boys’ Home, a Church of England orphanage. In the milieux Henderson frequented during the ‘phoney war’ in London, homosexuals were far from invisible, although homosexual acts were illegal and punishable by imprisonment. He became part of the ‘Soho Set’ of radical artist bohemians that included Paul Potts, the poet, Quentin Crisp and the Glasgow-trained painters Robert Colquhoun and Robert MacBryde. Neat mentions that Potts ‘fell head-over-heels in love with the young Scots poet’, though these feelings were not reciprocated by Henderson. Neat tells us that in Potts’ 1960 memoir Dante Called You Beatrice, his ‘love of Hamish haunts every page’. Paradoxically, Neat is more prepared to discuss Potts’ sexuality than he is Henderson’s. Neat’s book shudders and heaves with veiled references to homosexuality – ‘I shall go to bed now, thinking about the glorious evening we spent in that little room upstairs in Sassonero’; he ‘developed a literary relationship with a young waiter’; ‘it is unclear when and where he met Hamish, but he now became another of Hamish’s assistants, also his student’ – the biographer does not clarify further. These references may well be innocent, but whether they are coded or not, the reader has to try to negotiate meaning from them. I appreciate the inclusion of much previously unpublished information about the circumstances that led to the creation of what can be regarded as some of the most sublime war poems of the second world war. It is fascinating to learn how it came to be that the surrender of Italy was made to one Captain Hamish Henderson at the age of twenty-five. I am also keen be told, without unnecessary elision, what else it was that went into the making of this very remarkable figure. The biography’s minor faults – mostly typographical – can be considered, literally, as mere details; but the major ones are difficult to overlook and they do vitiate the production. Another instance of Neat’s inability to represent his subject credibly is when he writes about Henderson’s unattractive habit of ‘sorning’, which according to the writer Alastair Reid means, ‘to come for supper and lodge for a month’. Neat explains this Harold Skimpole-like aspect of Henderson’s ‘wandering lifestyle’ as ‘partly a product of need, but also a consciously didactic act: he wanted to nurture charity in his fellow man and he wanted to test the human will in Scotland.’ Next time I mump a drink from friends, I shall tell them that I am merely nurturing their charitable side! In preferring instead to portray his subject as saintly or otherworldly, Neat sorely tests the credulity and forbearance of the reader. While he may have been motivated to do this out of a kind of loyalty, the result is skewed, if not distorted. To Hamish Henderson, Neat seems unable to attribute any of those slight flaws, mild failings or interesting character defects that make the rest of us simply human. 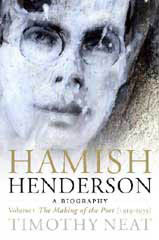 At the end of his preface, Neat writes, ‘lifelong [Hamish Henderson] took pleasure in his ability to shock the complacent, but more importantly, with Druidic cunning he delighted in revealing more by always concealing something.’ This latter impulse, whether conscious or not, seems to be what the biographer himself has emulated, but with questionable success.